Equipment for work-at-height and rescue professionals: fall arrest, work positioning, personal escape, difficult to access and confined space rescue systems. Specialised headlamps for professionals. 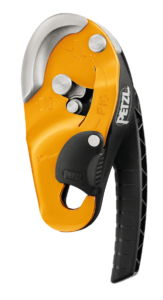 To see the full product range, please visit the PETZL PROFESSIONAL WEBSITE. The new RIG has landed in New Zealand, the 2018 version of the RIG’s AUTO-LOCK system automatically locks off the load and returns the handle to its initial position, has a higher weight rating and will now work on skinnier ropes as well as being reinforced at wear points. RIG is a compact self-braking descender designed for experienced rope access workers. It has an ergonomic handle that allows comfortable descent control. The AUTO-LOCK system allows users to easily position themselves at the workstation without having to manipulate the handle or tie off the device. Once locked, the rope can be taken up without having to manipulate the handle. The safety gate allows the rope to be installed with the device remaining connected to the harness, facilitating passage of intermediate anchors. The stainless steel wear plate improves durability by reinforcing the rope friction zone.